Alternative Names: Inca Berry, Peruvian Berry. 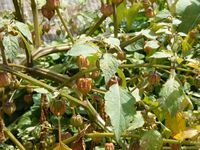 Golden berry is a short-lived perennial that is native to the Andes where it has been cultivated since Incan times. It bears cream to pink-purple fruit, 2cm in diameter - each covered in a purple streaked inflated calyx that resembles a papery lantern. In summer and early autumn the papery lanterns will turn brown and the fruit will fall off when they are ripe. The fruit is sweet like candy - a cross between cherry tomato and cherry with a hint of cinnamon. Will grow in any well-drained soil in sun or light shade and needs a pH in the range 4.5 to 8.2. The berries can be eaten fresh or cooked - use in snacks, pies, cakes, jellies and salsas. Popular in smoothies, salads and fruit salads and it can be combined with avocado. High pectin content - make great jams, chutneys and other preserves. If the fruit is left inside the husks, its shelf life at room temperature is about 30-45 days. When put in the fridge it will stay fresh for up to 3 months. The fruit is rich in vitamin A, C and some of the B complex (thiamine, niacin and B12), carotenoids, protein and phosphorus. 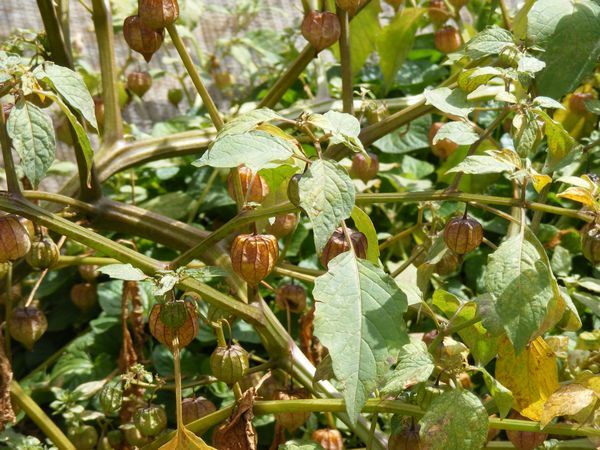 In folk medicine, Physalis peruviana has been used as a medicinal herb to treat cancer, leukemia, malaria, asthma, hepatitis, dermatitis and rheumatism.